This speciman of a penstyle e cigarette battery has a pretty fit size for being 2600 mAh. It has a bigger charge hold than most penstyled batteries. 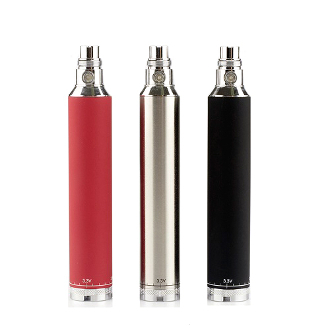 The 2600 mAh twist battery is variable voltage and can be spun to your specification between 3.3 and 4.8 volts. It makes a great pairing with single and dual coiled clearomizers and allows the user to control the amount of power and vapor they recieve. Variable Voltage 2600 mAh Twist Battery has the standard five on and five off button push as a safety feature and a battery power saver. The battery charges through its neck with a ego 510 usb charger. Since it does have a bigger battery capacity it might take a little longer than others to charge back up completely, but its important to remember no over charging your batteries as you can damage its internal system.